I have an app on my phone that tells me what I was up to on that day in years previous. It’s fun to see how much the kids have grown, remember family holidays and past accomplishments. On Friday it reminded me that three years ago, I stopped writing this blog anonymously and came out as the bird behind Cooker and a Looker. I’ve deleted many of those old posts because the photographs were terrible and I didn’t want them to occupy space on the inter web that could be put to better use by photos of cats or the new Magic Mike trailer. Last year when the blog turned two, I revisited my very first post – vanilla braised beef cheeks. I made and photographed it again for a side by side comparison and reminded everyone just how awful my photos were in the beginning. It was so much fun, I thought I’d remake another old favourite and give it the photographs it deserves. 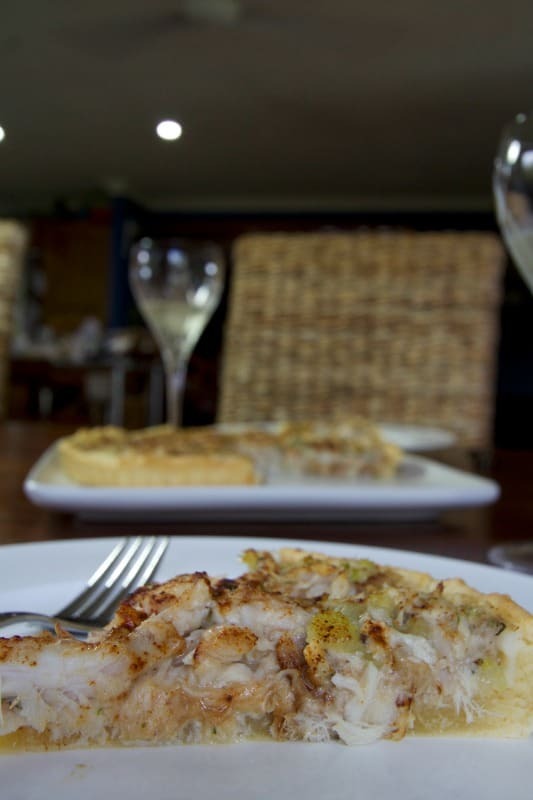 The recipe comes from The Doyle’s Fish Cookbook, first published in 1979 by the family behind the famous seafood restaurant of the same name. There are a few processes involved, but I guarantee you will not be disappointed should you give it a bash. To make the pastry, combine the butter, flour and salt in a food processor and whiz until it resembles fine breadcrumbs. Beat eggs into water for a couple of seconds until mixed. Add the water and eggs to the flour mixture and stir until you have a nice wet dough. This is where my food processor found the going too tough, so I turned the dough out onto the bench and continued kneading. Roll out the pastry to fit the tins you are using. Grease the tins, place pastry in it, prick the bottom of the pastry, then line with baking paper. Use dried beans or baking beads to blind bake the pastry case at 180°C until lightly browned. Take out of the oven and remove the beans. To prepare the fish for filling mixture, place fish and fish bones in a large stock pot. Cover with water. Add the vegetables, herbs and salt. Bring to a boil and simmer for fifteen minutes. When cooked, strain everything through a fine sieve, reserving the stock. When cool enough to handle, separate the fish from the vegetables, remove all the bones. Set aside until ready for use in the filling mixture. For the filling mixture, melt the butter in a large saucepan. Add the flour and stir until all the butter is absorbed – cook for a further minute, stirring constantly. Gradually add the stock, stirring constantly until the mixture is thick. You’ll have stock left over – freeze it and save it for a rainy day or a rad risotto. Add the flaked fish, celery, anchovies, sauces, nutmeg, basil and dill. Cook for five minutes. Add the parsley. Place the mixture into the cooked pie shells. Sprinkle with paprika. Return to the oven and warm through – about ten minutes. Much has happened since I “came out” as a blogger. The Little Sister who then couldn’t walk, is now my wonderful photography assistant (when she’s not sticking her fingers in the pie!). I can’t wait to see what the next three years will bring. what were you doing three years ago? 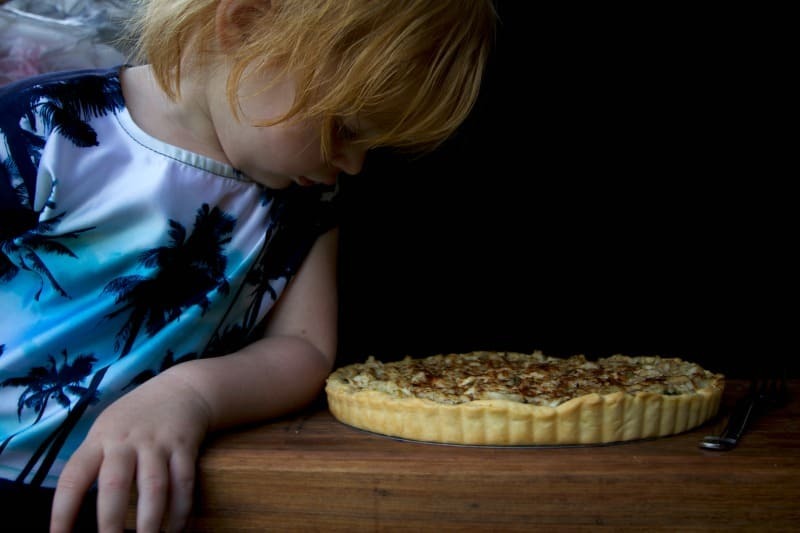 That pie, your little girl and your photography look awesome! Congratulations on 3 years! 3 years is inspiring, and your photo is fab, and I am adding this recipe to next weeks meal plan! 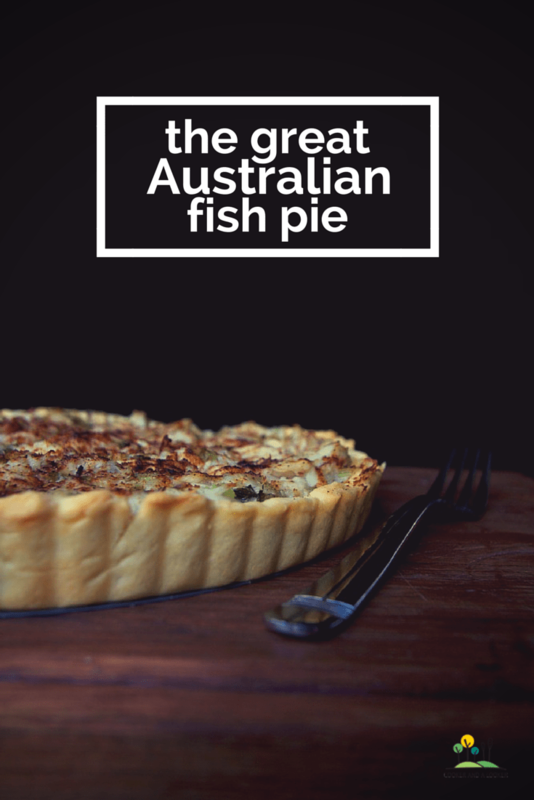 We were only talking fish pies at work last week. My work colleague had made one, I commented that I hadn’t but would like to and now look here, you have the perfect recipe for me to try, it sounds absolutely delicious Amanda and your photo’s are beautiful. Happy 3 official years of blogging! Thanks for linking up with our Fabulous Foodie Fun.